Okay, I know I said I was going to have to pass on Readukkah this year. Then I said I was going to read The Hired Girl after all. Well, let me tell you, Hanukkah is nowhere near as long as I thought it was when I was a kid. ("They get presents for eight days! And nights!") Well, it is eight days, but I only have three of them left to finish reading The Hired Girl and get my Readukkah post posted. That's not going to happen. However, I had what I would call an interesting Readukkah experience while I was making dinner Wednesday. I kid you not. While I was browning chicken wings, I listened to the Enough with the Holocaust Books for Children! podcast at The Book of Life. In it, panelists discussed an abundance of children's books dealing with the Holocaust while other aspects of Jewish life and history don't get as much attention in children's literature. I particularly enjoyed the bit about wanting to find trashy Jewish YA for those teenage readers who would embrace that. How to make other types of Jewish children's books successful? our panelists asked. Company's Coming had a huge impact on my life. The day after I read it to my sons, it inspired my short story, How Mom Saved the Planet, which was later published in Cricket Magazine. And another version of How Mom Saved the Planet became the first chapter of my first book, My Life Among the Aliens. I may not have had a writing career, if not for Company's Coming. I just reread this book for this post, because I own a copy. Now that it has been pointed out to me that there is a Jewish vibe to this story, I can see it. The characters have names like Moe and Etta. I can definitely imagine a character in Seinfeld telling this story about one of his family members going over-the-top because unfamiliar dinner guests are expected. "They brought a hostess gift, for crying out loud! When do aliens bring hostess gifts?" (Which is, of course, the punchline/climax in Company's Coming.) Jerry Stiller could play Moe in a movie. Shirley's voice may have a tone we've come to associate with Jewish characters. "They look like nice boys." "So they look a little different, I'm sure they're friendly." Now that it has been pointed out to me that there is a Jewish vibe to this story, I can see something deep and subtle going on here--Oh, let it go, Gail. This is a funny book about your favorite type of humor--the culture clash that occurs when two different groups come together. The aliens bumping up against middle aged Jewish characters inspired my books about aliens bumping up against suburban child characters. Another interesting point I realized about this book this morning: This is a picture book with no child characters and no animal characters filling in for kids. Adult characters, Jewish connection...Some enterprising student in a child lit course could do a big paper on Company's Coming. 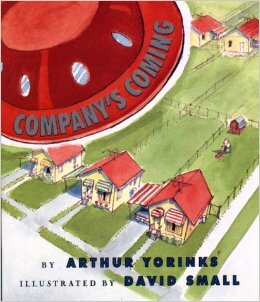 Company's Coming looks like a fun book. I'll check it out! Hope you find it. I would guess it's at some libraries. I'm very happy that you enjoyed the podcast, and that it gave you a way to participate in #Readukkah after all! And how cool is that, that Company's Coming was so inspirational for you!